Grab a poutine or smoked meat sandwich, Intertops Poker and Juicy Stakes Casino are now hosting a $500 GTD Montreal Lunch poker tournament every Monday to Saturday at lunchtime in Quebec. Buy-in is only $8 for the new online poker tournaments, held when it's lunch hour in the unique eastern Canadian city. The game is no-limit Texas Hold'em. Players receive 3000 starting chips. Blind levels are 10 minutes. Re-buys and add-ons are available. Intertops Poker and Juicy Stakes Casino are the busiest poker rooms on the Horizon Poker Network. "Tabernac! 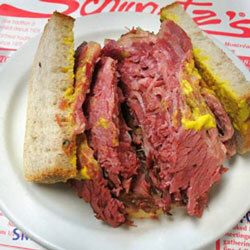 You get this amazing smoked meat and bagels there," said Intertops' poker manager. "And something they call poutine – French fries with cheese and gravy. Trust me, mon ami, it's incroyable!" To get the week started, this week there's also a $200 GTD Get-Up-and-Go tournament Monday at 6:10 pm Eastern. It's a turbo/knock-out tournament; there won't be any re-buys or add-ons. You can register for Montreal Lunch and Get-Up-and-Go tournaments under the Tournaments tab in the poker software.